We have heard of how Israeli agricultural scientists turned the deserts of Sinai into greenlands producing fruits and vegetables, making Israel one of the largest producers of oranges in the world from the desert sand. As per a TOI newspaper report, Hungund taluk, Bagalkot dist in N Karnataka in India has about 11,000 hectares of farmland under drip irrigation. Drip irrigation is gaining in importance across the world especially since we have been observing erratic patterns in rainfall and precipitation and falling river and reservoir levels necessitating more efficient and effective use of existing resources of water. 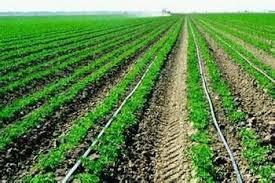 Simply speaking drip irrigation is a system of providing water to the roots of the plants through a network of pipes to increase irrigation. In any drip irrigation system one needs to be worried about two aspects of the system, the design of the system and its maintenance. 1. Water sources and the pump - either from a borewell or well, pond or river. 2. Filtration of the water - depending on whether the water is from a borewell (only screen filter) or whether it is from an pond, well or river, we require a sand filter and hydro cyclone filter besides the screen filter. 3. Network of pipes - has a system of main pipes, sub pipes and laterals spread across the field to which the drippers are connected (or end tubes). The mains and sub mains should be submerged 45 cms below the surface for safety of the pipes from being trampled upon by farm animals. To prevent rats and squirrels from damaging the pipes, it is recommended to keep bowls of water in the farm so that the drippers are not damaged. For drip irrigation we need a pressure of 1.5 to 2 kg/sq cm in the lateral pipes while for a sprinkler system we need a pressure of 3-5 kg/sq cm. For widely spaced plants, the drippers need to be of 12 mm dia laterals which can carry 250-300 liters of water per hour while for closely spaced plants, we need 16 mm dia laterals which can carry between 450-500 litres per hour.The drippers should be placed at a gap of 30-40 cm for closely spaced crops. Drip Irrigation Systems, courtesy FAO, United Nations. Maintenance of the system is of great importance to ensure high effectiveness and longevity of the system. Use of high quality ISI mark pipes and valves made from virgin plastic instead of the cheap recycled plastic can ensure longevity of the system for upto ten years if the pipes are exposed to sunlight for upto 800 hours a year. Clogging of laterals and emitters prevents the flow of water to the roots of the plants. This happens because of algae deposits, sand, organic material, Calcium Carbonate etc. Acid treatment and chlorination ate two methods by which clogging can be prevented. Filters are to be cleaned of impurities daily and flushed cleaned weekly of impurities. End caps of sections and laterals should be opened for upto 30 minutes occasionally once in a couple of days. Adding Hydrochloric acid at 25% concentration is an effective way of cleaning pipe from clogging of organic impurities. Maintaining a pH value of 4 (acidic) throughout the pipe for upto 24 hours, is a good way to do this. This is an excellent video which University of Agricultural Sciences Bangalore of 30 mins duration, which states all details about the drip irrigation system and the problems that can arise while operating it in Indian conditions. Jain Irrigation Systems is one of India's top drip irrigation company. Click here for the more commercial details. As per the Times of India, the world's largest drip irrigation project is coming up in Bagalkot in Karnataka. Covering about 35000 hectares of arid farmland in two phases, the Rs 768 crore scheme will benefit almost 15,000 small and medium farmers in the area. The scheme will help the farmers in the area to double the production of maize and jowar in the area. After the first five years of operation and transfer of ownership based on a BOOT model, from the Jain Irrigation group, the farmers will pay a meagre charge of Rs 1330 for each acre to the Water Users Associations, who will help maintain the system in the long run. The success of the Bagalkot project will give the needed boost for other drip irrigation systems in the country and abroad. With dwindling precipitation noticed in certain areas of the country, especially North Karnataka and the impact of the seasonal El Nino Southern Oscillation across the world once in seven years, it is all the more important that drip irrigation systems are given the needed fillip and encouragement across the country to help build the needed food stocks for food security in the country. 2. Jain Irrigation Systems, Drip Irrigation, , Last accessed Aug 2017. 3. Times of India, World's largest Drip Irrigation Project, Aug, 30, 2016. 4. University of Agricultural Sciences, Bangalore, Karnataka, India, Drip Irrigation a detailed overview, Your agri channel, Youtube, 2014. I truly like to reading your post. Thank you so much for taking the time to share such nice information about drip irrigation. Keep sharing.